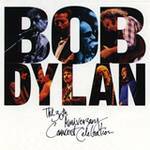 An enjoyable document of a star-studded concert celebrating Dylan's 30 years of recording, Bob Dylan - The 30th Anniversary Concert Collection isn't consistently strong, but there are enough good moments to make it worthwhile for most Dylan fans, as well as fans of the performers themselves. Neil Young steals the show with his thundering versions of "All Along the Watchtower" and "Just Like Tom Thumb's Blues." And Sinead O'Connor is nowhere to be found on either of the two discs. Introduced by Eric Clapton (audio sample of Clapton's introduction available) , who claimed that hearing Music from Big Pink had changed his life and music forever, the Band did an acoustic version of Dylan's "When I Paint My Masterpiece" (original version on the Band's album Cahoots), with Levon on mandolin, Rick on guitar and Garth on accordion. They were backed by the house band with Booker T., Donald "Duck" Dunn, Steve Cropper, and Jim Keltner on drums. There is also a short interview with Levon and Rick on the video from the event, which is quite hilarious.